Farmington Hills, Mich. — The Post-Tensioning Institute (PTI) opened its 2019 PTI Project Awards cycle, through Dec. 31, 2018. 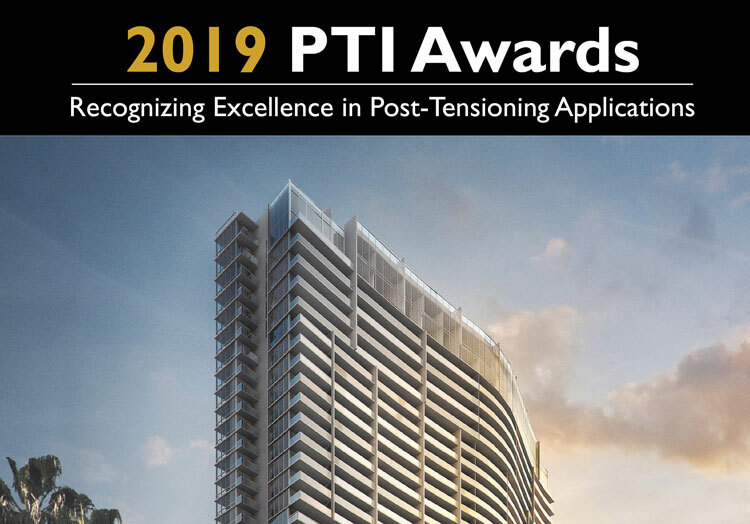 The PTI Project Awards are presented every two years and recognize excellence in post-tensioning applications in the following categories: buildings, bridges, parking structures, slab-on-ground, industrial/special applications, and repair/rehabilitation/strengthening. Any structure that uses post-tensioning as a structural component, was constructed or rehabilitated in the past seven years, and was not entered into the 2017 PTI Project Awards is eligible. Entries may be submitted by the owner, architect, engineer, contractor, or post-tensioning supplier. Winners will be selected by a jury of distinguished industry professionals, and entries are judged on creativity, innovation, ingenuity, cost-effectiveness, functionality, constructability, and aesthetics. Awards will be given in each category and presented during the PTI Awards Dinner on Monday, May 6, 2019, during the 2019 PTI Convention in Seattle, Wash. In 2017, 13 projects were recognized and the coveted PTI Project of the Year Award was presented to Baldridge & Associates Structural Engineering (BASE) for its project, The Ritz-Carlton Residences Waikiki Beach, Phase 1, located in Honolulu, Hawaii. Entries submitted for the 2019 PTI Projects Awards will be accepted through Dec. 31, 2018, and all entry information and instructions can be found via PTI’s website at https://www.post-tensioning.org/events/awards/projectawards.aspx.